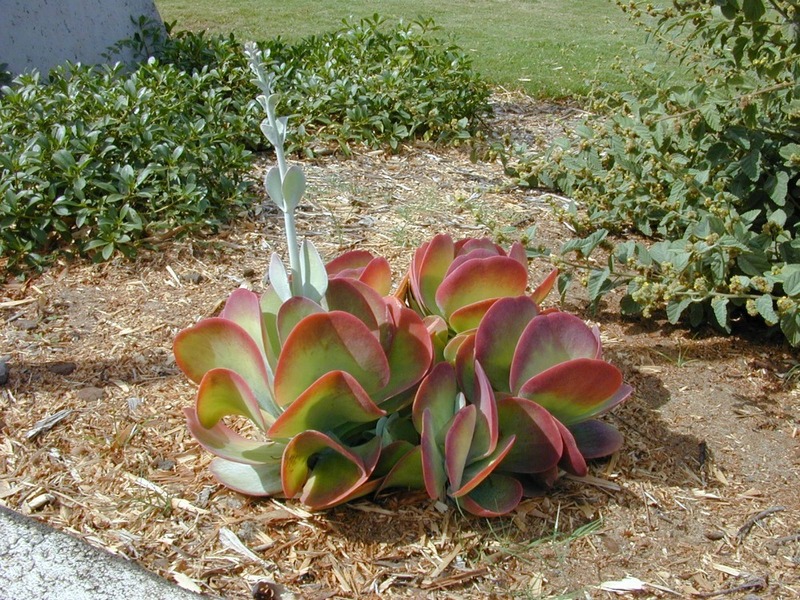 Minimalist gardens in Southern California often depend on big or unusual succulents to serve as focal points. But, these architectural gems can also stand out in those that heave with native plants and smaller succulents. Often how you plant a succulent determines whether or not it is showy. 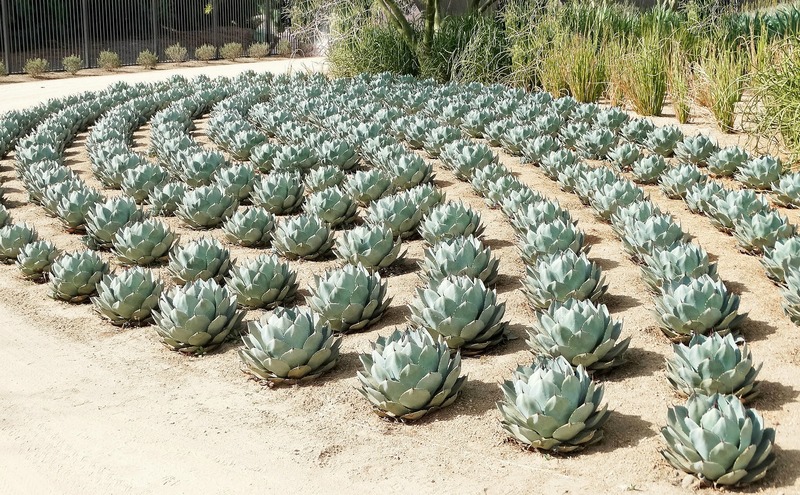 The above gardener chose to plant large artichoke agaves in cool spiral pattern, something that could also be done on a smaller level. They also must be clipping off the pups or new growth in order to keep each rosette in pristine shape, which brings us to another point… how you choose to maintain the succulents determine its look. Water-wise succulents are often purchased in small sizes so it might be difficult to imagine what they’ll look like at maturity. Therefore, we’ve put together a list of showy succulents to consider for your outdoor living space. Each has interesting color or leaf shape and can be purchased in local nurseries. Since it’s pictured above, we’ll start with artichoke agave. It’s a suckering agave which means that pups shoot out from its base to form clumps of different-sized rosettes that can grow up to 5′ wide. Leaves are wide with a blue-grey tint and some homeowners actually plant it as a groundcover. If you’re on the coast, this succulent requires little to no water and full sun to light shade. 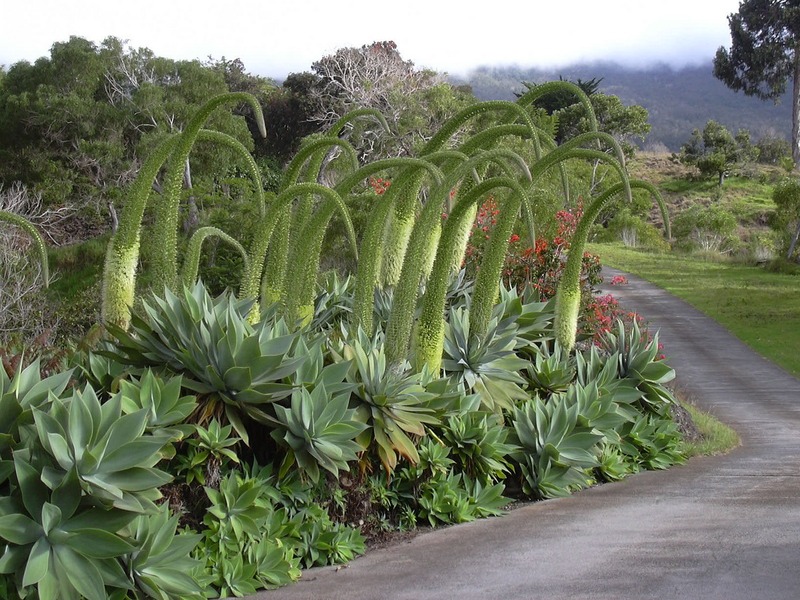 After about 10-15 years in the ground, it will shoot up a 15-20′ flower spike. Speaking of spikes, be mindful that the tips of this plant are quite sharp so it’s not appropriate for dog-friendly gardens or close proximity to children. 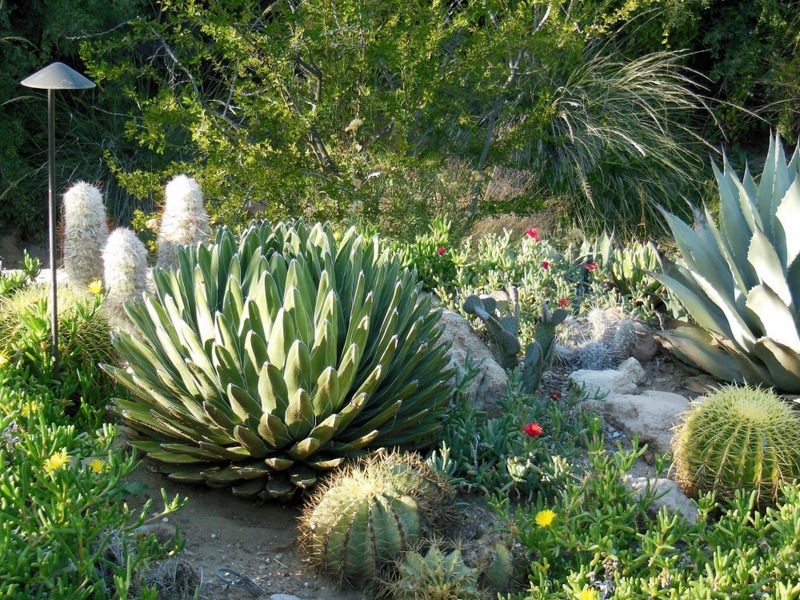 Agave attenuata requires very little care in Southern California. In fact, it can thrive with neglect even in clay soil. Individual rosettes can reach a massive 4′ wide. You definitely need space for this plant, however, like the above artichoke agaves, this one can be groomed into shape. Coastal full sun is ideal along with infrequent watering though its can tolerate moist soil. The blue-green leaves look fantastic when paired with a blue ground cover succulent or blue rock garden underneath. If the rosettes ever become to large for your liking, there is a market for them in Southern California because this is an easy succulent to transplant and an expensive one to buy in a large size. If a neighbor or gardener can’t replant them, consider reselling them. I bought an Echeveria ‘Afterglow’ in a small 4″ pot and forgot about it. Luckily, it was being watered by sprinkler overspray. I kid you not, it’s 12″ wide just a few months later. 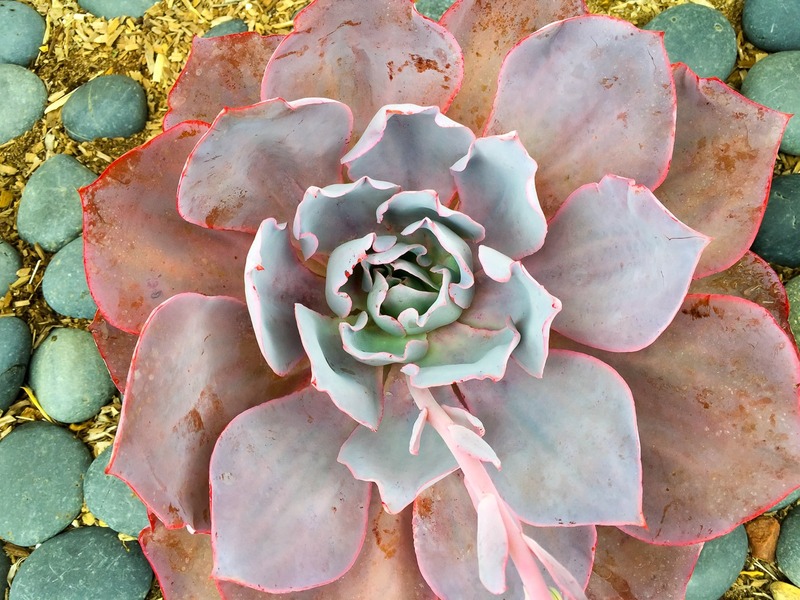 This beautiful succulent is low maintenance with lavender-pink leaves that have a bright pink outline. This is your contrast plant. While it would look beautiful planted on its own, consider pairing it with bright greens, blue rock or even a yellow sedum. While it does sprout orange flowers, you’re better off cutting them as flowers stunt growth of the entire plant. 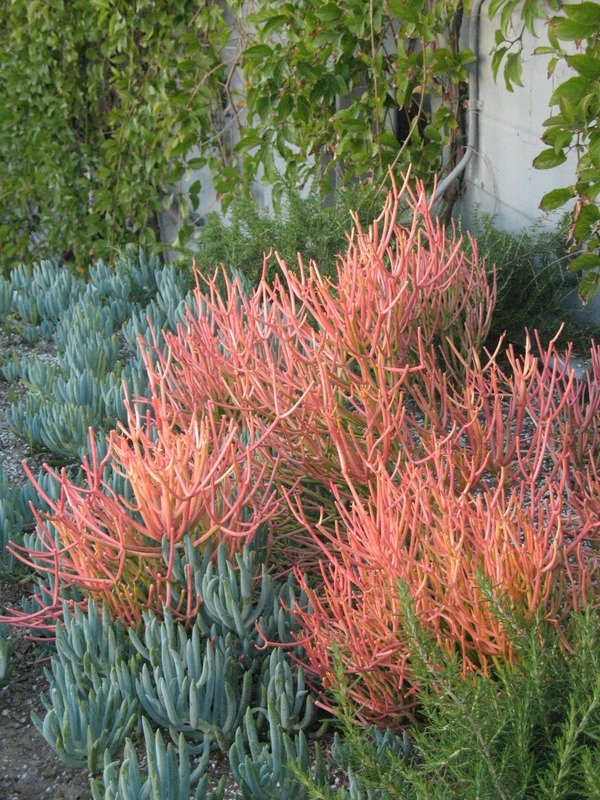 The Sticks on Fire plant is incredibly common in Southern California for its combination of bright orange, yellow and green. Usual height is about 4-8′ tall by 3-5′ wide. Leaves are shaped sort of like pencils and become a bit more yellow in the summer and darker orange in the winter. Note that the plant has a milky sap that some people are sensitive to. It only appears when you break a stem, but it’s never bothered me. I have several of these plants around the house. They are the most stunning when planted in combination with something blue or bright green, as the homeowner above did. This might be a slow-growing agave but give it time and it will certainly be a focal point in your water-wise garden. Queen Victoria agave grows in tidy clumps to about 1′ tall but 1.5′ wide and is easy to maintain in coastal gardens. Its leaves are tapered and a deep green with white accents. Like many of the other succulents on this list, it needs full sun to light shade and very little water. Consider it as an option for a container planting as it does require good drainage. Some even choose to grow it as a houseplant because it remains happy in more or less the same shape and size with good care, for a long time. These bright green aeoniums look like dinner plates, flying saucers or perhaps even a medium-sized pizza. They practically hug the ground, growing flat with leaves that grow in sort of a mesmerizing pattern. While the plant is water-wise, it’s not one that can just be plopped into the ground. Between it’s dislike of moisture and leaves that need to be kept away from rocks or hardscape that might burn leaves in summer, I find it does best in filtered sun and well-draining soil. But when planted in the right spot, it’s so odd looking that people are sure to compliment. Purple tree aeoniums are very popular in Southern California because of their unique color and resemblance to flowers. 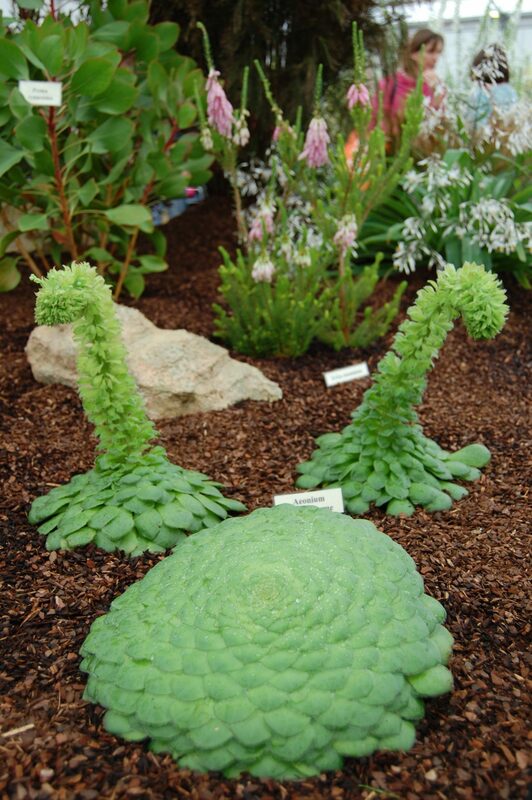 Why not go for one of the largest kinds available though as most gardeners seem to opt for the smaller Aeonium arboreum ‘Zwartkop’. 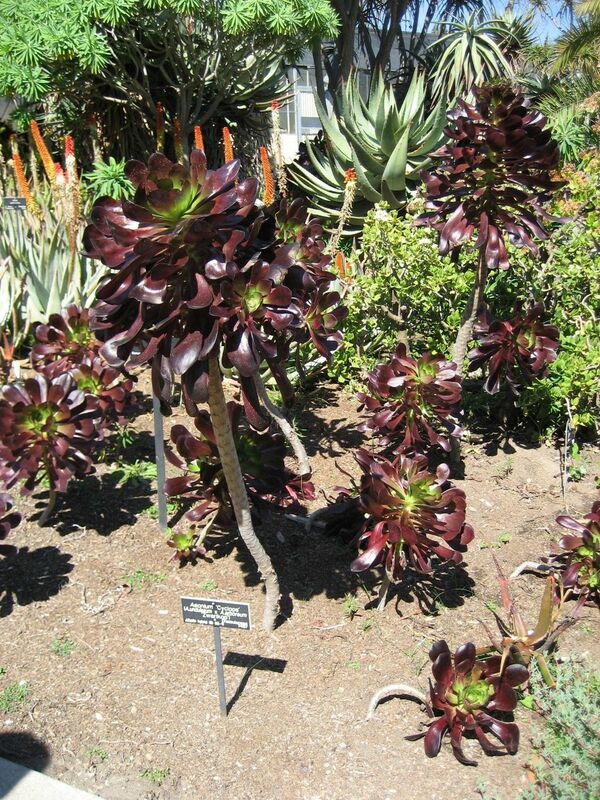 Aeonium cyclops stems reach 3-4′ tall with big red rosettes. Aeonium ‘Voodoo’ is similar in look but grows about a foot taller. Tip: Many of San Diego’s Farmer’s Markets have venders who sell excellent quality succulents at prices that are lower than local nurseries. What show-stopping succulents do you have in the garden?